NEWARK, Del. 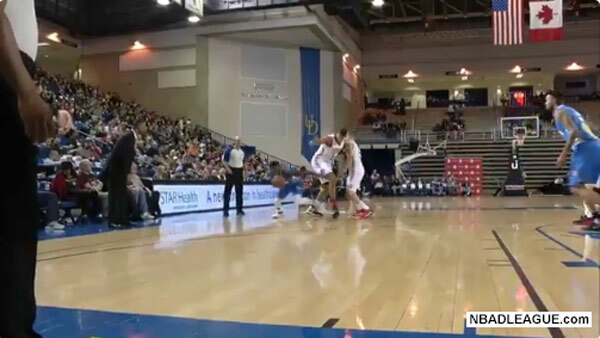 (WPVI) -- The Delaware 87ers may have lost to the Raptors 905 in Saturday night's NBA D-League game, but they did it with style. In the second quarter, Delaware's 5'9 Nate Robinson had only one way to get past 7'3 Edy Tavares - by dribbling under him! The three-time NBA slam dunk champion made his way through Tavares' legs to the hoop. While Robinson didn't get the basket, he did get a foul and a SportsCenter moment at the Bob Carpenter Center. "You're not likely to see that very often folks," commentator Joe Tordy said. "That's one advantage for Robinson if you're listed at 5'9." The Raptors 905 got the 110-96 victory, but Robinson definitely won move of the game. You can watch the full game below.